You are here: Home / Administration / Is a fall charity auction date better than spring? The Chair of a school auction called me a few days ago to get my opinion. Her committee is thinking of moving its fall charity auction date to a new day and season. Traditionally the fundraiser has been held in December, but they’re considering an auction date in the spring so as not to compete with their Annual Fund. In one respect, it doesn’t matter. As long as a committee follows the principles of conducting a successful auction, the gala can succeed. But I do see some distinct advantages to holding an autumn charity auction. As serendipity would have it, within a couple of days of that phone call, I received a call from a different client. They are planning for their third gala. The first two years the event was held in the spring. Now they are toying with a 2010 fall date. The event manager asked me to provide her with some reasons as to why a fall date would be advantageous. 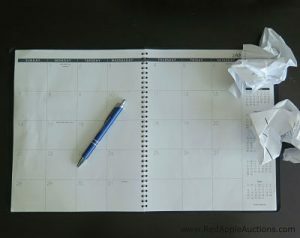 Here are four advantages to scheduling your charity auction date in the fall. Generally speaking, spring is a more popular time for events. So if your organization hosts a spring event, your procurement team will be seeking auction donations, underwriters, and sponsors at precisely the same time as other groups. Some organizations host fundraisers which have no auction component. They might plan an annual chef’s event, or “roast” someone prominent in the community. These fundraisers-without-auctions also prefer spring dates. This means that even though you might not compete against these groups for donated auction items, you will compete against them for attendees. You may enjoy less competition in the fall. Fall auctions lend themselves to specialty silent auction sections which are geared towards decorating your home. Several of my November auctions will have a silent auction section devoted exclusively to selling holiday decorations. One of my September benefit auctions had a mini-section of Halloween decorations ready to be purchased. In contrast, I have yet to see a spring auction create a silent auction section around “Valentine’s Day decorations” or “Easter decor.” We Americans are quick to decorate our front yards with scarecrows on Halloween and Santa Claus in December, but we don’t get as excited about putting a billboard of President Lincoln on the front yard for his February birthday. In the fall, Christmas is a-comin.’ Many of your guests will be buying presents. Those gorgeous baskets, clever activities, and unique items can easily become gifts for friends, family, and co-workers. Why not work with the natural rhythm of our holiday cycle by picking an auction date that occurs during a time when we need to buy gifts? Got other ideas? Leave a comment! I host an annual fundraiser dance without auction for Jill’s House in DC. For the past two years I hosted it in September, but for this year I will do it in May. I think we’ll get more action. We’ll see. Sounds like a good idea, Robie. I enjoy September and October events … and that’s usually a beautiful time of year in Washington, D.C., too. Let me know how it goes!